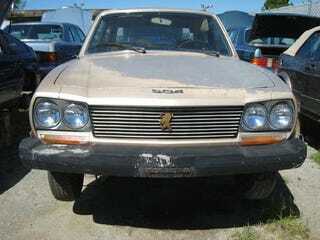 While we don't see many French cars still on the North American streets, they do show up every so often at junkyards; we saw a '69 Renault 16 not long ago, and I stopped by the same junkyard last weekend and found this '76 Peugeot 504. The 504 is the only French car I've ever actually driven and worked on for any amount of time, and I recall thinking it was a very pleasant car to drive, when it ran... which was seldom. Most of my quality time with my Peugeot was spent staring at befuddlement at some broken mechanical device apparently designed in a parallel universe where every facet of automotive engineering diverged from our present course in about 1920. But it had factory 8-track, and you can't ask for more than that! Make the jump for Gallery #2.